Despite concerns by the state about equal access to polls, King County has funded a measure that will pay for ballot postage. The Metropolitan King County Council on Monday passed a measure to fund prepaid postage on mail-in ballots for this year’s elections. The 7-2 tally came after a vote was delayed last week on the $381,000 request at the suggestion of Councilmember Reagan Dunn, who wanted time to explore the issue. The measure had the support of six council members last week. Dunn and Councilmember Kathy Lambert voted against it. King County Elections Director Julie Wise brought the proposal to the council with the objective to increase voter turnout by reducing barriers to voting and discussion was largely supportive of Wise’s proposal and objectives. The request’s sponsor, Dave Upthegrove, echoed Wise in stating his belief that prepaid postage will increase access to the polls for all voters, especially younger voters who don’t carry or use stamps much, and for the county’s low-income voters. Lambert voiced the most concerns at the meeting, worrying that jumping ahead of the state’s plans to implement prepaid voting puts other counties without the resources in a difficult position. The state has urged King County to postpone its vote to ensure voter-access equality statewide. The prepaid postage debate now shifts to Olympia where Gov. 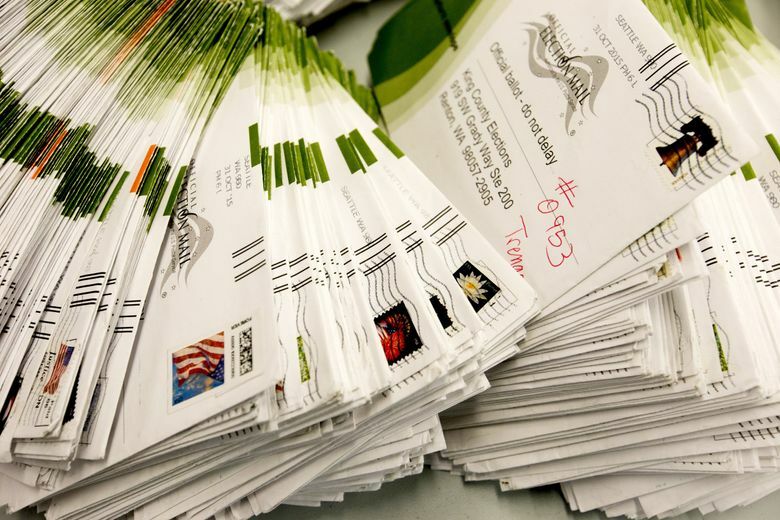 Jay Inslee is considering an emergency request by Secretary Secretary of State Kim Wyman for $2 million to fund prepaid postage for mail-in ballots statewide this year. Wyman made the request a couple days after speaking before the Metropolitan King County Council about the supplemental budget request it was considering. Tara Lee, a spokeswoman for Inslee, said emergency funds are limited, but that the governor’s office is working with Wyman’s office to find out if there is a solution. In a letter to Inslee, Wyman wrote that her office’s highest priority is voter equality and the requested money is needed to ensure all counties are acting the same for the 2018 elections. The letter pointed out King County’s huge influence on statewide elections, ballot measures and legislative and congressional races that spill across county lines. “In all these races, King County voters would have enhanced access to the ballot box, thus treating voters differently across the state,” Wyman stated in the letter. After the county council voted King County Republican Party Chairman Lori Sotelo urged the governor to act on Wyman’s request. Kittitas County is one of those counties that will be sharing ballot questions with King County this election cycle, including the closely watched 8th Congressional race, a district that runs from southeastern King County along I-90 through Kittitas County and up to Chelan County. County Auditor Jerry Pettit, who runs Kittitas County’s elections, said he has been closely following the movement toward prepaid postage in King County. He isn’t too worried about his giant neighbor to the west acting on its own. His focus is on meeting the state’s mandate to install more drop boxes. Kittitas currently has four drop boxes and needs to install six more. Pettit is trying to have those in place for the primary. The Legislature has had a difficult time passing prepaid postage legislation. Despite the history state Sens. Joe Fain, R-Auburn, and Mark Mullet, D-Issaquah, will introduce a bill funding prepaid election postage across the state. Wise also hopes that King County’s foray into prepaid postage will lead to some relief from a state law requiring one dropbox per every 15,000 people. The bill, which passed this last legislative session and didn’t include any funding, requires King County to go from its current 56 dropboxes to 86. Wise’s believes providing prepaid postage reduces the need for dropboxes that have a cost to maintain and operate on election night. This wouldn’t be the first time King County has used prepaid postage for ballots. Three special elections in Shoreline, Maple Valley and Vashon Island, acted as test runs last year. Shoreline had a 10 percent increase in voter turnout, from 30 percent to 40 percent. Maple Valley increased turnout from 31 percent to 37 percent and Vashon Island inched up to 52 percent from 46 percent. Election officials have been trying to make it easier for people to vote since the county adopted mail-ballot voting in 2009. Ballots in King County are provided in Korean, Spanish, Vietnamese and Chinese. The county has partnered with Seattle Foundation to educate voters and increase turnout. Of the $381,000 supplemental budget request, $191,000 would come from jurisdiction taking place in the election. Postage would cost 50 cents per piece and the county will not be charged for ballots not mailed.